We are ready for the Thoroughly Poetic Thursday challenge! With their capes and suits and arrows. Do you know the ones of whom we speak? And Batman, with justice that he seeks. Who was raised by a warrior mother. Who go on all sorts of heroic adventures. The latter a man with green skin and bulk. And they include the hammer-wielding Thor. But let's put those heroes aside for now. Giving them all the credit should not be allowed. Because they are not the only ones up for a heroic task. Never forget the heroes who don't wear capes. In truth, heroes come in all sizes and shapes. In fact, have you ever heard tales of the little heroes? Their tales should not reach a meager audience of zero. To tell you a tale of two little heroes who once were stray. They did not have a home but instead lived on the street. They also have whiskers, tails, and walk on four feet. But they were destined for greatness from the day they were born. Let us go through the facts in a quick little sprint. And with them their human is really quite smitten. And their human is a girl known as none other than Flora. And that is the story of how they did meet. With Flora, her parents, and her brother Jerome. For neither Perseus nor Pandora is an ordinary cat. For this tale is about to take a turn. On a day that boasted grey skies and mighty winds. When suddenly the wind blew something that way. And after it a little boy did run and cry. As he stood in the street looking quite sad and alone. Perseus was the first to paw at the glass. For it to open, and quick, was what he did ask. Until they were finally noticed by their girl Flora. And the sight of the sad boy her eyes did meet. "That boy could use a hero," Flora did admit. The kittens meowed their agreement with grit. And so Flora said, "All right, if you must. But do make sure you're home before dusk." And then toward the little boy they advanced. Which was how they learned that kites were the boy's obsession. Since in the wind the boy's favorite kite had billowed. And that was why the boy now did cry. For they would get his kite back in a hurry. And so Perseus put his nose to the air. He sniffed and sniffed to find the kite's where. But they could not see it above the buildings and trees. For Pandora was a pro at seeing over everything tall. Pandora first hopped up on a nearby wall. Her skill was so great she needed not fear a fall. So that nearly the entire world she could see. No sights could Pandora miss from that tall height. Which is why she quite easily caught sight of the kite! It still blew and floated through the air. 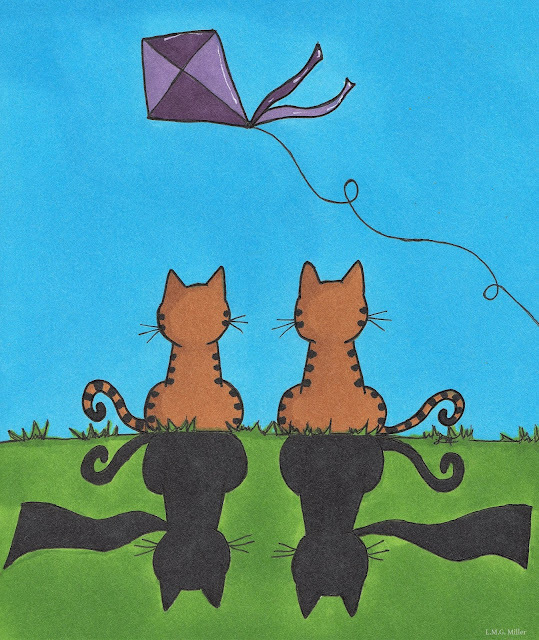 Pandora knew they must hurry so the kite they could ensnare. For nearby was a squirrel who hung its head low. Pandora mewed and asked him what was the matter. The squirrel said, "There is no way I will ever get fatter. But I cannot find it anywhere far or near." For that is something to which the little heroes were not accustomed. And against the ground he even let his ear rest. And told the squirrel that was where his walnut was safe and sound. Until they could finally see the kite from where they did stand. For at the corner stood an old woman of roughly 99. But she was admittedly not very steady on her feet. And to her a nice little treat the old woman did toss. Then the hunt for the kite did continue. In the distance, the kite was still in view. Until finally the wind began to die down. Instead, around a tall tree limb it did become wound. "No worries!" the kittens told the boy. They would return to him his flying toy. But from the task Perseus and Pandora did not flee. And that way they reached the kite in no time! And had it back in the boy's hands long before moonlight. The boy jumped for joy and thanked the little heroes. Out of the happy boy a great many gratitudes did flow. Perseus and Pandora told the boy it was their pleasure. They were happy to return to him his flying treasure. Perseus and Pandora bid the boy a good night. And wondered where their next adventure would lead them to roam. Don't forget heroes exist everywhere, if you know where to look. After all, heroes come in all shapes and sizes. Some wear capes, and others furry, four-legged disguises. As per usual on Thursdays, we will now segue to this little cutie. 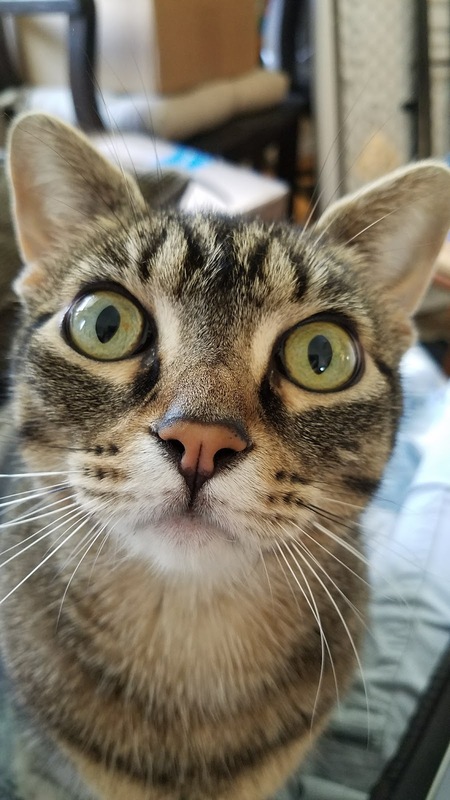 This here human's sister snapped that photo the other day. She sent it to me when I was away from home, and told me that Thimble was trying to tell her something. What was it that Thimble was telling my sister? 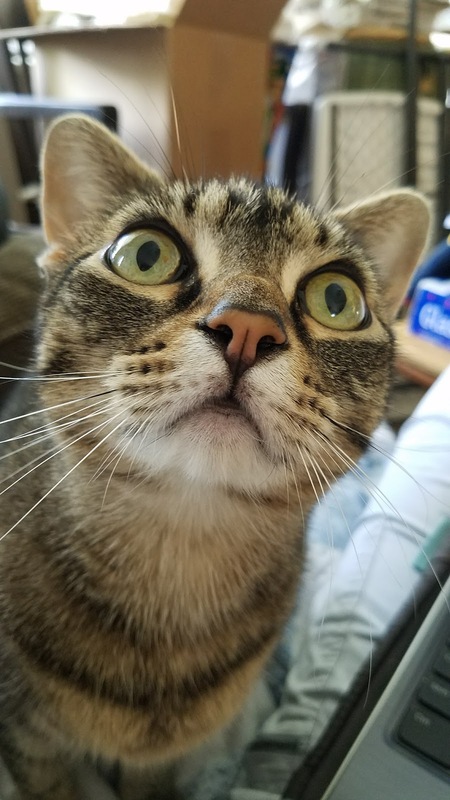 Well, she was letting her know that she shouldn't look up, because something pretty scary was up there. I guess I have to admit that both my sister and myself have a tad bit of arachnophobia. We had a real battle with this bugger. We may or may not have lost said battle. In other words, I don't know where the spider is. It got away, and there was much panicking. I sure am thankful for furbabies who warn us of dangers frolicking on the ceiling overhead (even if the humans can't handle the situation). Of course, we are thankful for so much more. All of us here are grateful that we have each other, and for our family and friends, which certainly includes all of you. We are also thankful for a safe and cool home this summer. We purr, woof, and pray that all individuals could know such comfort. 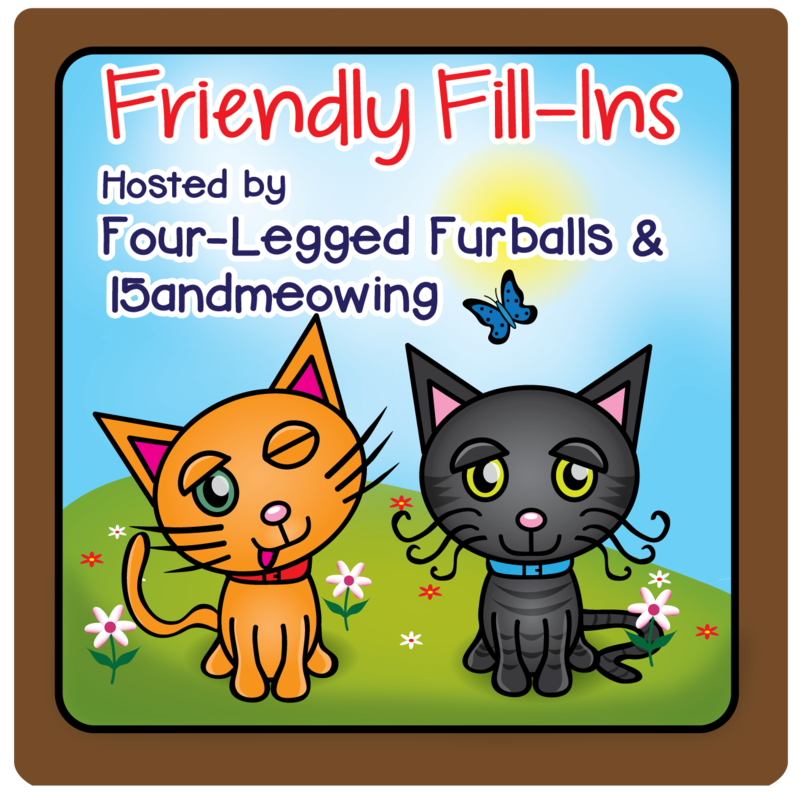 Last but not least, we have for you the fill-ins for tomorrow's Friendly Fill-Ins challenge. Ellen of 15andmeowing crafted up the first two, and I came up with the last two. Wishing all of you friends of ours a wonderful day! Let's continue on with our food tips. There is sometimes debate over the health benefits of a dry versus a moist food diet for our furbabies. In some cases, dry food can potentially help keep teeth free of tartar and other such issues. This is not a guarantee, however, as animals on a dry food diet can still end up needing dental cleanings. Nevertheless, in some cases, a dry versus a moist food diet can very well affect the teeth. For example, does your furbaby have painful teeth, or no teeth at all? In this case, a moist food diet is often recommended. There are also special diets formulated for dental health, in the case that a cat or dog might benefit from this. Not only are the teeth affected by dry versus moist food, though, but also other parts of the body. Moist food, for example, is obviously high in moisture content, and so it is often recommended in the diet of any furbaby who might benefit from taking in plenty of moisture. This would include animals with kidney disease, as well as those prone to UTIs, crystals, and so forth. It's also important to think of the foods that cats and dogs eat in the wild. They often eat the meat of prey, which is not all that crunchy and which is high in moisture, and which therefore might indicate that moist food is more in line with how they would eat in the wild. Of course, though, sometimes it all comes down to the cat or dog's preference. Some cats and dogs refuse to eat dry food, and some refuse to eat moist food. In such cases, we have to take this into consideration and select foods that they will consume, as food intake is of course crucial. Astrid is repeating herself again. She is, predictably, a pouty puppy in the window today. This time she didn't just stop there, though. Astrid thought you all might like a little bonus shot. Perhaps a close-up of her sniffer? Oh, is that not close enough? Astrid can fix that. Here, how's this? We sure hope you all aren't getting bored of Astrid's predictable pouty puppy shots. I'll have a talk with her on the importance of variety in model poses. We are finally back at our foodie doodles. We've been working on the suggestions you all gave us, when we asked you what foods you would like us to doodle up. Today, we have a little something that a certain tortie requested. 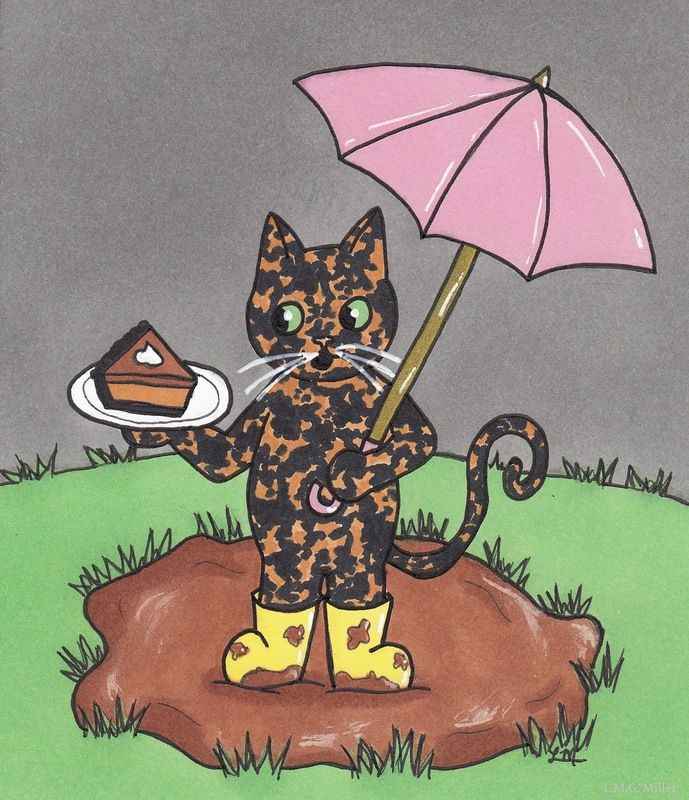 And that is, a mud pie suggested by Mudpie! Today's food tip is all about those carbs. When we think of carbohydrates, things like pasta and bread may come to mind. But, carbohydrates in other forms are also an important aspect in pet food. In a dog or cat's food, carbohydrates often come from plants or grains, such as corn, rice, oats, or wheat. Just as in humans, carbohydrates can serve as a source of energy and fuel for our furbaby's body. That being said, carbohydrates are one aspect of pet food that may hold different levels of importance for cats and dogs. Dogs are omnivores. This means that, even in the wild, they get their nutrition from both animal and plant sources. For this reason, carbohydrates in the form of plants and grains are of course important in commercial dog food, just as meat products are. On the other hand, cats are strict carnivores, and in the wild they gain much of their nutrition and energy from the protein and fat of their prey. This is why plants and grains in commercial cat food is sometimes debated. Some studies indicate that cats in the wild do consume a small percentage of plant and grain carbohydrates, these being from whatever vegetation their prey may have eaten. Regardless, most commercial cat foods do contain carbohydrates from plants and grains, some in far higher percentage than others. This is where reading labels and comparing protein versus carbohydrate levels can be important for cat owners to do. Not only is it important to consider a cat's strict carnivore ancestry, but it's also important to realize that for cats as well as dogs, a diet with a higher carbohydrate content can potentially lead to digestive concerns, such as diarrhea or flatulence. In addition, just as can be the case with fats and even protein, an excess of carbohydrates in the diet can potentially lead to weight gain. This is all just one more reason why it is so important to research, understand, and discuss with your veterinarian the best diet for your kitty or pup. Evan is happy that he gets to be the star around here three days in a row. That's right, he starred in our selfies on Sunday, he was here to celebrate Memorial Day yesterday, and now here he is again for Tabby Tuesday. Do you like how Evan put those tabby stripes of his on display for this Tabby Tuesday? Evan tried to pose for some more tabby-liscious shots, but his photographer assistant of a mom did horrendously at her job. Just look at that. This mom of Evan's couldn't even get all of his handsome face in that last photo. Evan is not impressed. He wants to know if any of his furiends out there have a photographer as unskilled as his? We want to wish you all a terrific Tuesday! 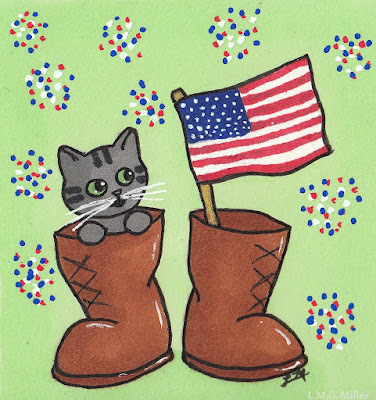 Yesterday, for Memorial Day, we had to share an old, throwback patriotic doodle. That was because our scanner decided it no longer wanted to communicate with our computer, so getting our doodle onto our blog just wasn't happening. After this human enlisted the help of her technologically capable sister, though, our scanner is up and running again. 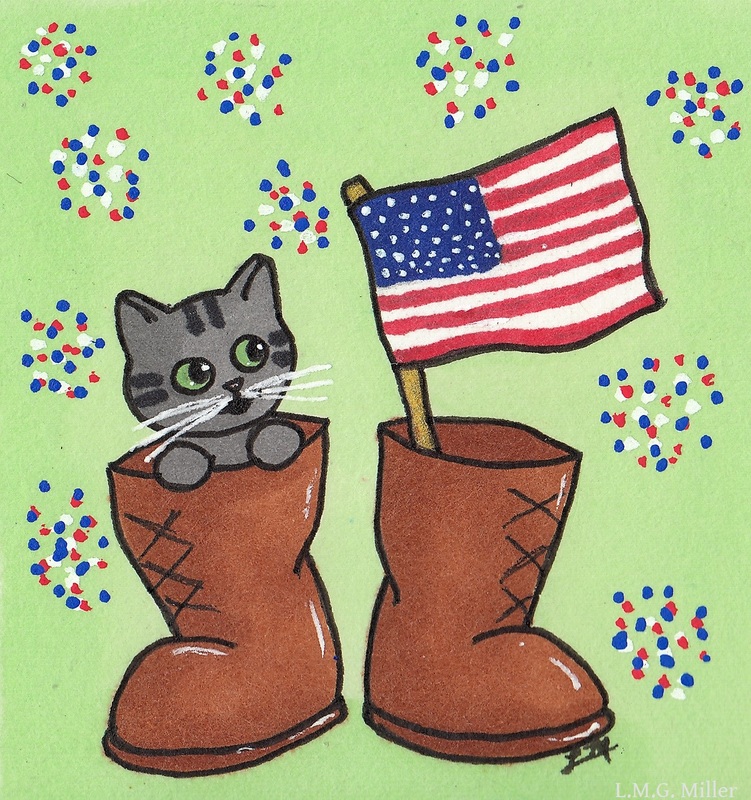 Now, though, we have a Memorial Day doodle to share with you a day late. We hope you don't mind. Now that we have our scanner back up and going, our foodie doodles will continue tomorrow! In case you missed our previous posts that mentioned this, to go along with our current string of foodie doodles, we're repeating a series of food tips we shared some time ago. We've so far talked about protein and fiber in pet food, and now today we're moving on to fat. Fat, like other nutrients, plays important roles for both us humans and our cats and dogs. Fats are yet another source of energy for the body and its cells, they aid in healthy skin and coat, and they are also important for growth overall. In pet foods, some fats can come from the protein source, such as chicken and beef. However, there are also other potential sources of fats in our furbabies' food. Fats can of course come from oils, such as fish oils or plant oils. The important thing is to make sure that your furbaby's food includes good quality fat sources, and in a healthy balance. For example, omega-3 and omega-6 fatty acids, which often come from sources such as fish or plant oils or chicken fat, are very beneficial, but most importantly so in proper amounts. Less quality fats and oils would include lard and other similar ingredients, and therefore do be cautious if you see these on a pet food label. Of course, any fats in too large of quantities could lead to health concerns. For example, obesity and pancreatitis can both potentially stem from or be worsened by diets high in fat. For reasons such as these, as we've said before, try to educate yourself on your cat or dog's health and the best nutrition for them, and of course discuss this with a veterinarian as needed. Today, we remember all those in military service who have lost their lives. We thank all of the heroes, whether they be man or woman or four-legged, for their service and sacrifice. We created a new patriotic little doodle for today. However, our scanner has also decided that it wants to go on the fritz. Even after hours of reinstalling it and fiddling with it, this technologically unsavvy human has not yet gotten it to work again. 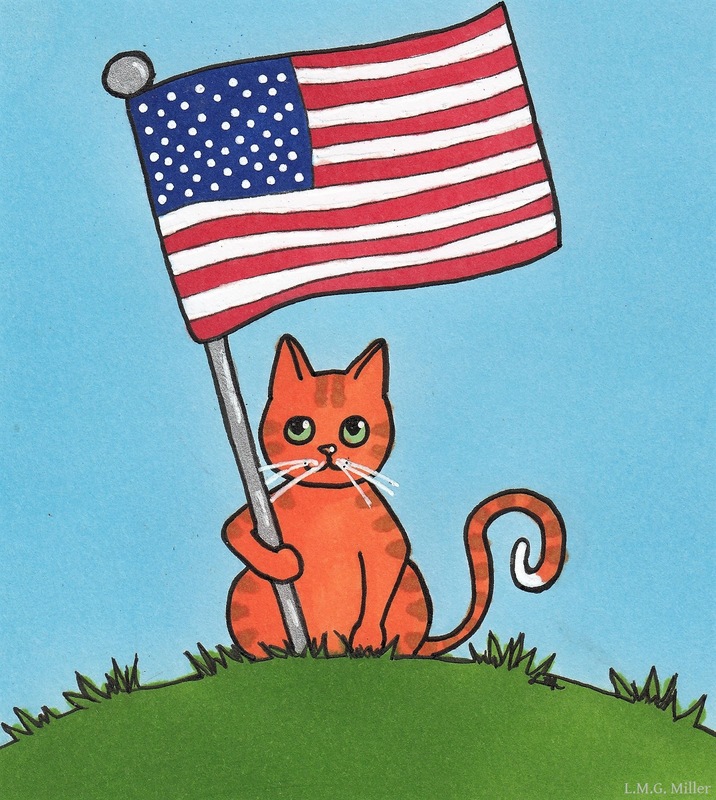 So, for today, we'll have to settle for a throwback patriotic doodle that we created and shared last year. That's right, we're going old school. We'll probably have to enlist the help of someone far more technologically equipped, like this here human's sister or dad, in order to get the stubborn scanner up and going again. If all goes well, we'll share this year's Memorial Day doodle tomorrow. We'll stop rambling now, though. Annie of McGuffy's Reader, the host of the Sparks blog hop, is taking a well-deserved blogging break. However, we still feel compelled to share some words of wisdom in honor of the Sparks hop. The quote we're sharing today is inspired by Memorial Day itself. To all of our friends in the United States, we wish you a blessed Memorial Day. To all of our friends, no matter where you are, we hope your Monday is magnificent. Our food talk continues today with a little something known as fiber. Fiber is a very important nutrient that, for one, aids in digestion for not only us humans but also kitties and pups. In terms of digestion, fiber can play more than one role. Depending on the circumstances and the particular type of fiber consumed, it can assist with both constipation and diarrhea. That's not all, though, as fiber can also play a beneficial role in weight loss. Fiber can make food more bulky, and in turn can help a kitty or pup feel full, which can then lead to less gorging and therefore aid in weight loss. Still, though, fiber's roles in a cat or dog's health does not end there. Studies have also indicated that high fiber diets can benefit those with diabetes, such as by helping to control blood sugar. For all of these reasons and more, be sure to educate yourself on your furbaby's fiber intake and overall health and diet, and of course discuss options with your veterinarian. We are so very thankful for all the sunshine we've been having, even if it's been making the great outdoors frighteningly hot. Around here, Evan is the king of sun puddles. They are easily his favorite part of summer. Evan thinks this mom of his can be a real party pooper, though. 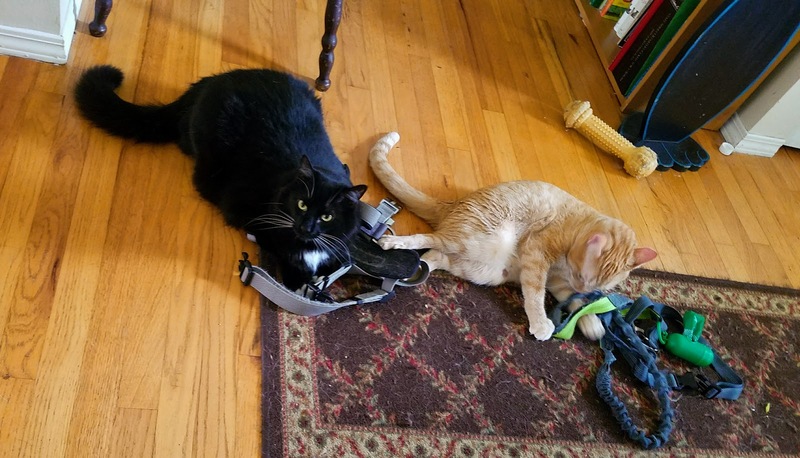 You see, she doesn't want him to overheat or get a sunburn, so she sometimes removes him from sun puddles if he's been basking in them for too long. Isn't that terrible? Evan hopes none of his furry friends have such horrible parents as he does. Well, anyway, Evan's sunny selfies up there are his contribution to the Sunday Selfies blog hop, of course hosted by the Kitties Blue over at The Cat on My Head. Have a stupendous Sunday, friends! Since we're all about foodie doodles these days, we thought we might go for some food tips as well. We've given these tips in the past, but we thought we'd repeat them again. After all, diet is a pretty significant aspect of our furbabies' lives. Over the next couple of days, we'll give some tips specifically regarding pet food ingredients. As you all surely know, the ingredients that go into a furbaby's food and therefore into their body all play an important role. Let's start today with protein, which is of course a significant part of any diet. Just as with us, our cats and dogs need protein, which can be broken down into amino acids, which can in turn be used to build up new muscles and other tissues. This is why high protein is especially important in a kitten or puppy's diet, as it ensures that they can form the tissues they need to grow into healthy adults. There are also some other special considerations to make when it comes to protein. For example, furbabies suffering from pancreatitis or diabetes often benefit from high protein diets. On the other hand, a cat with renal disease requires a low protein diet for the health of their kidneys. So, while protein is indeed an important part of any diet, do be sure to do your homework and certainly discuss with your veterinarian what ingredients you should consider for your furbaby's diet in order to keep them healthy. Disclaimer: Fear not. 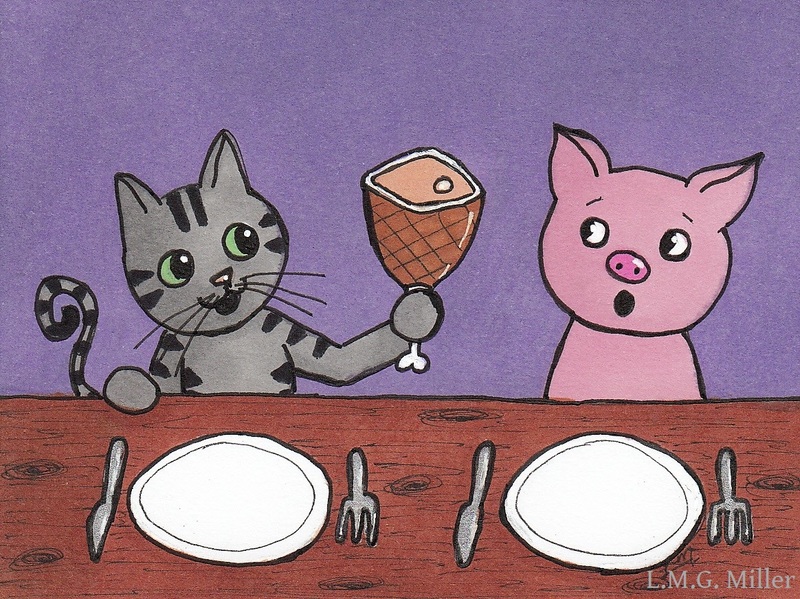 No kitties were eaten or harmed in the making of this doodle. 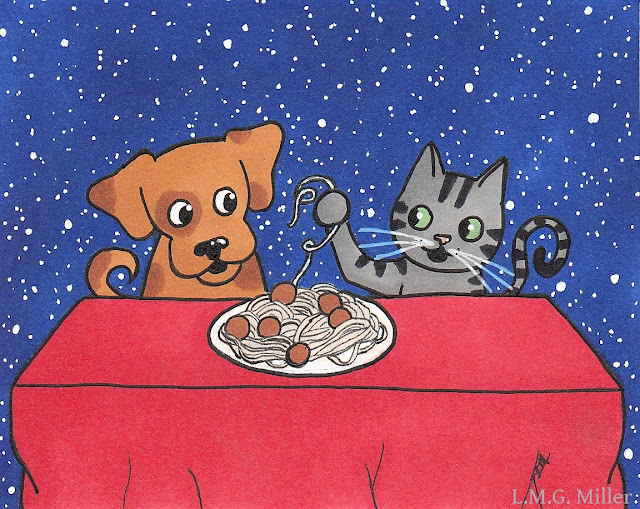 Our doodle for tomorrow was also inspired by Marg's suggestion, as it again stars a kitty and a pup. We won't give anymore spoilers on this, though. You'll have to visit us tomorrow if you'd like to see it. If you are looking for some sort of spoiler, though, some of the other suggestions we got lost week and that we have in the works include doodles with a mud pie (can you guess who suggested this one? ), pizza, and none other than a taco. We almost used kitty tacos in the doodle we shared today. But, then we opted for purritos instead. Don't worry, though, a taco or two is indeed on the way. 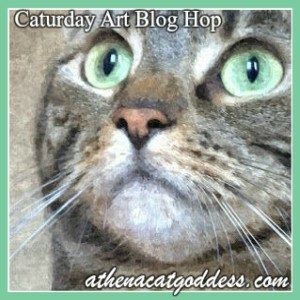 Our doodle up there is of course our entry to Athena's Caturday Art blog hop! 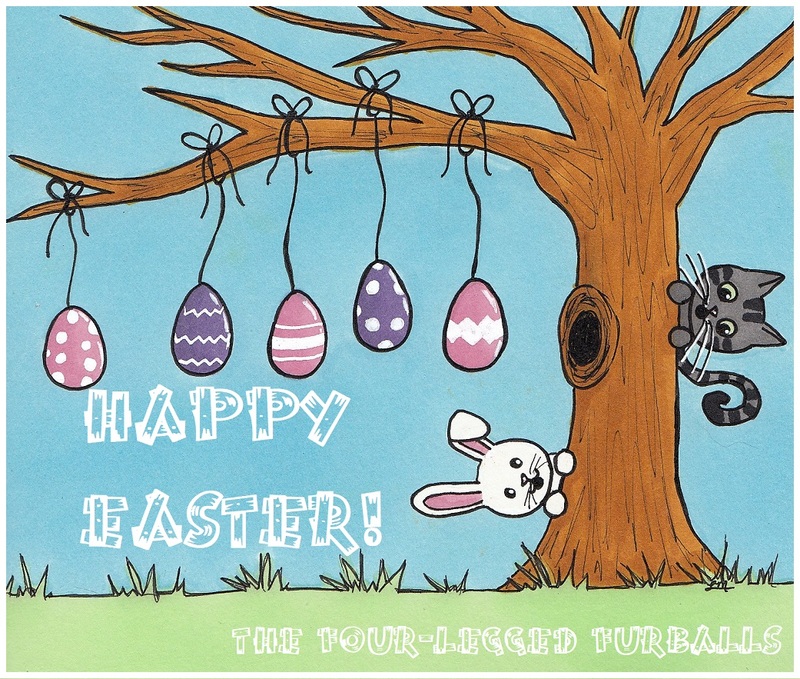 We hope all of you friends of ours have a terrific and tasty day! Today's summer tip is a bit of a fun one, but also one relating to food and hydration. What on earth are we talking about? Popsicles! It is possible to make popsicles for your pup or even your kitty. You can mix water with a bit of peanut butter, tuna, berries, or other safe food, and then freeze the mixture in an ice tray or popsicle tray. Once they're frozen, you can let your pup or kitty lick them. You can also place these frozen treats directly in your furbaby's water bowl, perhaps to entice them to drink a bit more (just be sure to remove any food remnants from the popsicle out of the water bowl, so that no spoilage occurs). These frozen goodies can make a great treat on a hot summer day, as they can also help a dog or cat stay cool and hydrated. That being said, do ensure that your pup or kitty does not choke on small pieces of the treat, that chewers don't injure any teeth chomping on the ice, and also that your floors don't end up with melted puddles of left behind treats. 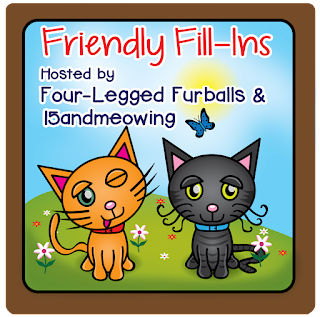 It's time for the Friendly Fill-Ins, friends! In case you missed them yesterday, below are the fill-ins for this week. The first two were crafted up by my co-host, Ellen of 15andmeowing. I came up with the second two. 2. The best part of last week was _________. 1. It is better to try and fail than to never try at all. 2. The best part of last week was visiting a new market in town. 3. Every summer, I melt. 4. Once upon a time, two kittens charmed a little girl. Some of you might know what's next. As happens every Friday on our blog, you now get your fix of Eddy! This girl is notorious for being happy and active and all shades of blurry in photos. We recently had a wonderful window whiffies session, though, during which I was able to snap lots of photos like these ones here. Just don't get used to this. I haven't managed to get Eddy to sit still for another photo shoot since this one, so I'm sure her photos will be back to wild and blurry soon enough. 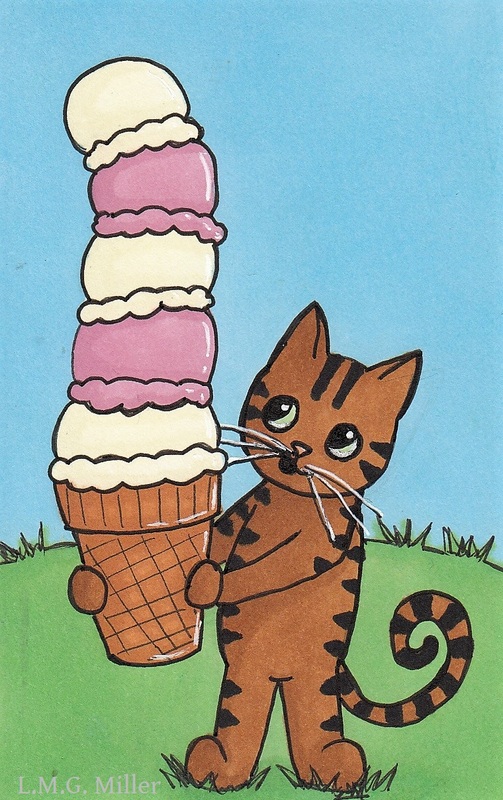 We still have a number of foodie doodles to share with you all. This one today is for Eddy. Eddy loves the fishies in her beloved aquarium. She also loves to steal their food. 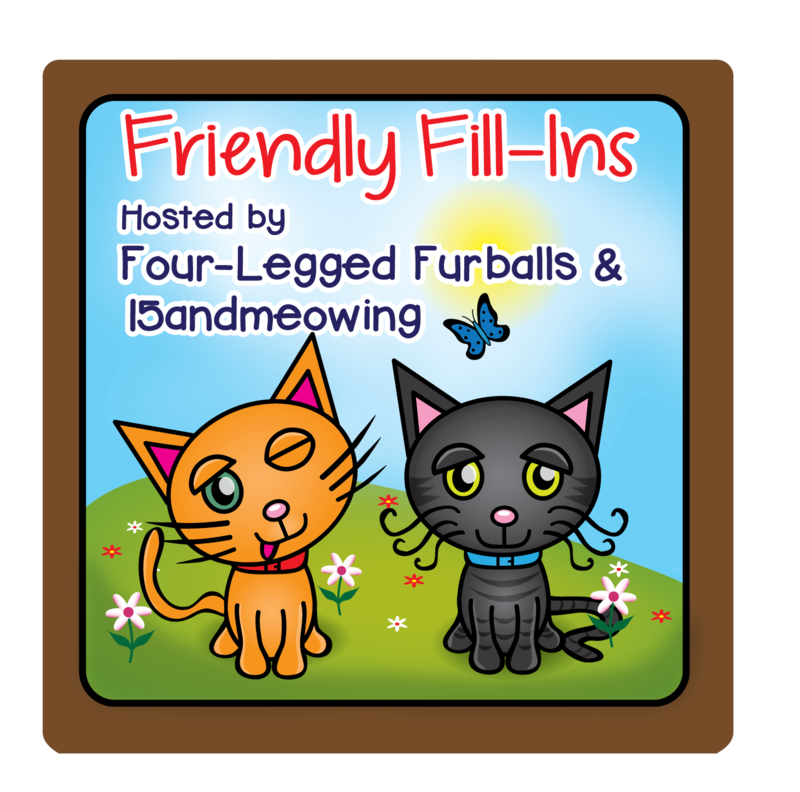 Yesterday, we talked about the safety of our furbabies around various insects and related pesticides. Today, we have another insect topic, but these buggers are more of a nuisance than a danger. What are we talking about? Ants! If you have a feeding station outdoors, either for your own furbabies or for strays and ferals, there is a chance that you've seen some ants helping themselves to the grub. However, you can attempt to keep ants out of the food with the aid of chalk. Using chalk, you can draw a box or circle around the food bowls, as that will often prevent ants from entering that area. Similar techniques could perhaps even be attempted indoors, should the ants make their way inside. You can even use colored tape or something else similar to form an ant barrier around your furbaby's food dishes. That all being said, remember that pesticides can, in many cases, be dangerous to our furbabies. This includes pesticides aimed towards ants. If you have ants in or out of your house, be cautious when using any form of ant bait or pesticide. Either find safe alternatives, or keep any and all ant traps well out of reach of the furbabies. It is of course always best to err on the side of caution, and to never use any products that could potentially harm your furbaby should they find it. It's Thursday again! Isn't it strange how that happens? Anyway, let's go right on ahead and start with the Thoroughly Poetic Thursday challenge, hosted by Angel Sammy and Teddy. Isn't that just lovely? I wish I could say my poem is as lovely as that image, but my rhyme is really just sort of weird and random. But that's nothing new. I usually like to explain how I got from the image to my poem. This time around, I'm not entirely sure myself. When I saw that image, the first thing that came to my mind was the song "Stairway to Heaven" by Led Zeppelin. I decided to look up the lyrics, to see if they could help me on my rhyming journey this week. The first lines of the song—"There's a lady who's sure all that glitters is gold"—only led me to think of a similar quote from Tolkien's The Lord of the Rings. Tolkien's quote goes, "All that is gold does not glitter." I don't really know how to explain my poem's progress from there, because at that point I sort of lost control of the situation. Watching the clouds above which him towered. Moving to and fro in the sun's bright blaze. He waited to see something fantastic unfurl. And he was even beginning to feel a bit grey. Luckily, Bobo was never disappointed by the clouds above. He once even saw a nebulous dog do the jitterbug! Watching the events of the clouds go by. Bobo could not wait to see the land of clouds go about its business. That day, a castle and its king first went by with great swiftness. Oh, look, there went an elephant! It was white and puffy and really not all that elegant. Then Bobo watched a parade of squirrels. Those cloud rodents were no less wily than those on a forest floor. Bobo could not believe what then did happen. 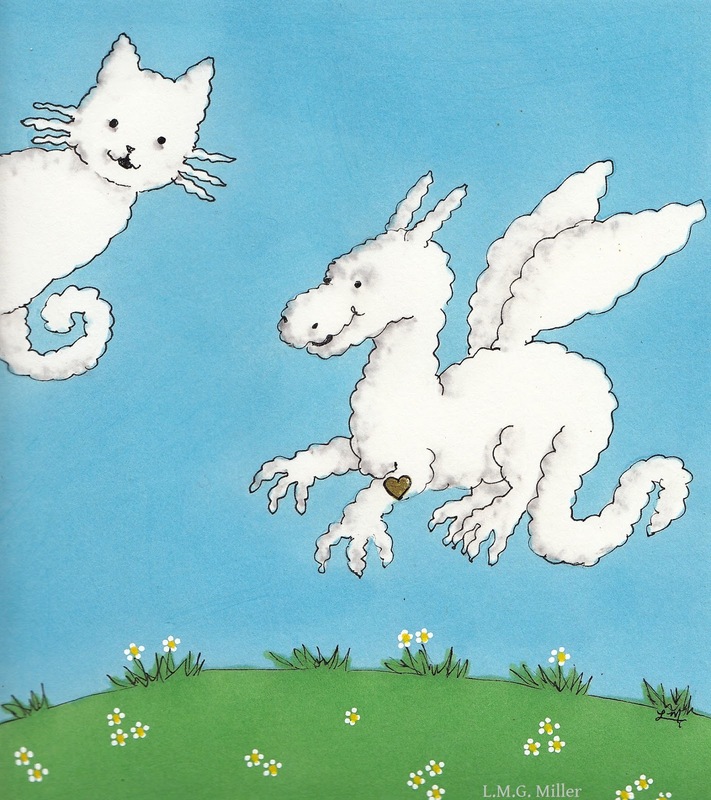 In the sky appeared a giant, fluffy, flying dragon! And no other form dared float in like a shroud. But something about the dragon made Bobo's heart flitter. After all, something in its midst did gleam and glitter! In the sun this beautiful mystery shone. It was ever so bright and sure to be gold. Bobo remembered the tales he had heard. Certainly those stories were not all that absurd. And how such gold could only be won by the bold and the clever. Bobo, for one, was proud of his courage and wits. That's why, then and there, he decided to act on his grit. And so Bobo got to work without stall. As he kept an eye on the clouds and the sun. And they were known to travel as far as the moon. And, thank goodness, old man Crumpet did not say nay. Hoping that this balloon would indeed take him that high. When he was as high as the clouds and traveling a speed of ninety-nine. Looking for the dragon and the gold it had surely amassed. And through a cloud garden that flourished. For they went on for twelve miles and more. But none of them belonged to his mission at hand. As well as a racing turtle and a hare. When his balloon ran into a cloud which in the sky was sprawled. Before he realized it was a giant white cat napping midday. "Um, excuse me, but you're in my way!" That was what Bobo yelled to the fluffy feline. He did not want to waste even a little bit of time. But only after Bobo gave it a firm poke. Seemingly as slowly as it could. And asked the purring cloud if it could move out of his way. Even its tongue was white and fluffy inside of its maw. And said, "Hello, my name Maeve." "I'm Bobo. Nice to meet you. Can you please move?" Of his words the cat did not seem to approve. "Why are you in such a hurry?" she asked. Bobo said, "Because I have a very important task!" "And what task is that?" "I seek a dragon. Not a cat!" The cat seemed quite happy with that answer. She exclaimed, "You must be looking for Dancer!" Bobo learned that was the dragon's name. He thought that really, truly quite strange. Bobo told the truth with great passion. "Dragons are never wanting for treasure. I wish to fight for gold without measure." Maeve the fluffy feline's tail twitched this way and that. She looked a bit like a perturbed cat. Bobo did not know if she was mad, sad, or neither. The cloud cat's thoughts he really could not decipher. For she began to settle in for another nap. Where to find the dragon she did let Bobo know. And so in that direction Bobo went forth. Finally, in the distance Bobo caught side of the beast. He decided that with the gold he won he would first have a feast. So that he properly surprise the dragon with his skill. Bobo's curiosity began to grow and grow. Thinking that what he saw was almost bizarre. For dancing clearly was his game. But soon after moved right on into the flamenco. Dancer was not alone, though. A solo he was not dancing, no. Surrounding him were all sorts of friendly clouds. Around Dancer they were forming quite a crowd. That was when Bobo realized it was more than just that. Dancer the dragon was now teaching them all how to tap! But clearly his presence had been made much clearer. Dancer saw Bobo and waved a hello. The dragon seemed like sort of a nice fellow. That was the greeting that to Bobo the dragon did send. "Would you like to learn how to jive? It will make you feel really quite alive!" At first Bobo shook his head and declined. But before long the joyous dragon had him dancing that jive. Bobo realized that he really liked to dance and strut! Dancer was a great teacher, that was for sure. He taught Bobo that, for a bad mood, dancing was the best cure. Bobo had soon forgotten why he had even visited the sky. That is, until something glimmered and caught his eye. He could not believe what it was that he saw. It was right there, above Dancer's fluffy left paw. You see, Dancer wore none other than his heart on his sleeve. The truth about it, Bobo could not believe. Bobo now knew what he saw earlier that day from beneath. For it was made of glittering gold. But not one that Bobo would ever dare steal. As is always the case on Thursdays, Thimble is now here to show off her cute self. The problem here, though, is that Thimble had a bit of a case of a photobomber. Do you see that back there? Toby really wanted to be part of the shot. Thimble wasn't quite sure what to think of that. Despite the photobombing incident, Thimble is very thankful that she got to enjoy even more window whiffies on a warm day. To be honest, she is also thankful for Toby, and for her other furbsibs. Without them, she would have no pals to boss around play with. And it's her gratitude for her fursibs that Thimble is entering into Brian's Thankful Thursday Blog Hop. All of us here are also so incredibly grateful for all of you. You friends of ours make us so happy, and we would be lost without you all. Last but not least, below are the phrases for tomorrow's Friendly Fill-Ins blog hop challenge. My co-host Ellen of 15andmeowing crafted up the first two, and I came up with the last two. That there is our new badge, created by one of Ellen's wonderfully artistic friends! This artist also created the original badge, when Ellen first began this blog hop with Annie of McGuffy's Reader. 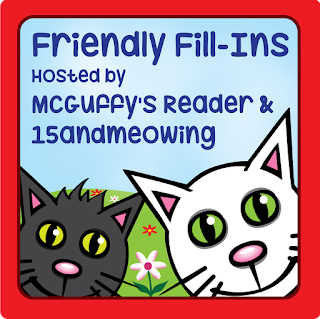 Jamie created a new badge, since Annie is taking a blogging break and I am co-hosting the hop with Ellen. I simply adore his adorable artistic style. To visit the artist's website, just click here! Today's summer safety tip is to beware the bugs. A variety of bugs begin to make appearances this time of year. That being said, many of those bugs bring with them their own sorts of danger. For example, some spiders, as we've mentioned before, have bites that are toxic. Bees, wasps, and other similar bugs can sting, and this can prove incredibly dangerous for furbabies with severe allergies to these stings. There are also of course mosquitoes, who can harbor those nasty, dangerous heart worms. That all being said, keep in mind that many bug sprays can also be toxic to furbabies. Spraying in your yard, or near or inside your home, can be dangerous for this reason. If your furbaby licks or comes into contact with certain pesticides, they could become sick and have serious side effects. There are ways, though, for you to help keep your furbaby safe from insects. For example, keep any water in your yard fresh and clean, as stagnant water attracts mosquitoes as a place for them to lay eggs. To ward off buzzing bees, try to keep plants that attract them away from areas where your furbaby frequents. When you are somewhere unfamiliar, perhaps steer clear of gardens, not only to keep your furbaby safe from toxic plants, but also from bees that might be hanging around the area. 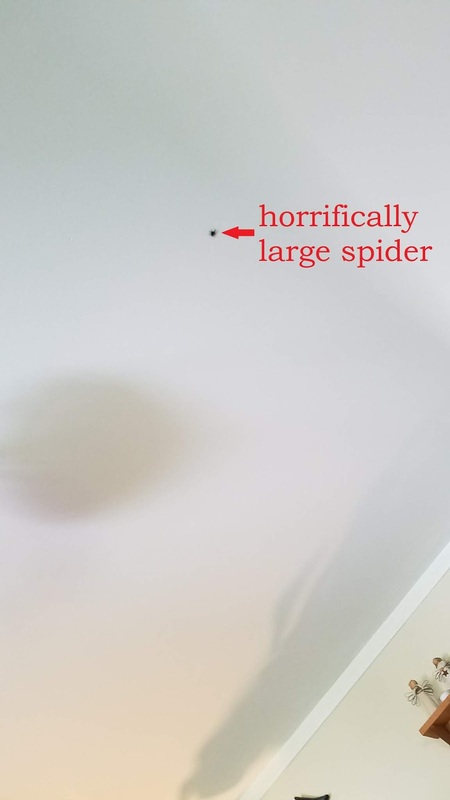 Though not always easy, keeping buggers such as spiders out of your home might be easier if you keep doorways and the like regularly cleaned. Ridding doorways of cobwebs, for example, can lead to less arachnid inhabitants. It is also worth noting that there are some pet-safe insect repellents on the market. Some products can keep bugs away in a more natural manner, such as by using certain scents to which insects are averse. This being said, though, even some of these more natural products can pose risks for furbabies, such as if they contain dangerous essential oils or other potentially toxic ingredients. For this reason, always read product labels, and discuss any concerns with your veterinarian. What's more, should your furbaby become sick due to an insect bite or sting, or due to ingestion of a pesticide, seek veterinary care immediately. You all must think I just keep posting the same picture of pup Astrid over and over again. Really, though, the truth is that she insists on posing the same way every single time she sees the camera. Maybe I can get the kitties to teach her some variety. 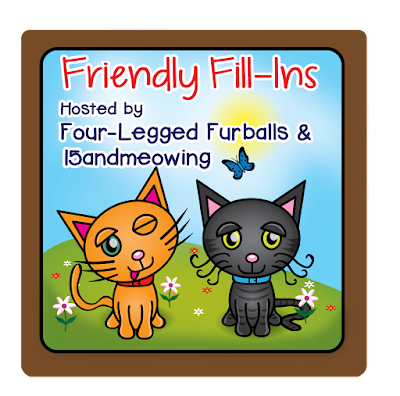 Now, Astrid is the last furbaby around here to complete one of the recent Curious as a Cathy Mewsic Moves Me blog hop challenges. This one involves spelling out your name with song titles. Here's how Astrid fared with that! Have a most wonderful Wednesday, friends! You'll probably see this tip from us at least once more this summer, but today we're already mentioning fireworks. These booming celebrations often make appearances during the summer months, such as for Memorial Day and certainly Independence Day. Needless to say, always be cautious with your furbaby around fireworks. First, close proximity to fireworks can lead to burns or other injuries. In addition to this, the sound and sight of nearby fireworks could cause a fear reaction, which could potentially lead to an escaped or lost furbaby. Speaking of fear of fireworks, it is of course best to keep your furbaby tucked safely indoors when fireworks are being used anywhere nearby outdoors. Even inside, though, it is possible for the sounds and sights of fireworks to frighten a pup or kitty. You can make some attempts to minimize the sight and sound of fireworks, such as by closing windows, closing blinds, playing music, turning on the TV, and distracting your furbaby with some playtime. Some dogs and cats are also calmed by wearing a ThunderShirtⓇ, or even a makeshift one created using a blanket, towel, or a piece of clothing. If your furbaby is still scared, sometimes it is simply best to allow them to hide. In this case, ensure they have somewhere to be and feel safe, such as a safe room or cubby in which to nestle while the fireworks are booming. Since it is always better to be safe than sorry, in case a fearful furbaby does somehow escape, ensure that they are properly identifiable. For example, make sure they are wearing a tag with your contact information on it. In addition, this is also when up-to-date microchips can be crucial. When Thimble realized we hadn't made a Toesies Tuesday post in a while, she simply had to remedy that. I asked Thimble to give us a little peek of her toe jelly beans, but she said that would have to be a photo shoot for another day. After all, she had a nap scheduled, and you don't just up cancel nap time. Since she was ready to settle in for a nap and call it a day, Thimble agreed to give Evan and Toby a little bit of time in this post. You see, this here human forgot to share the boys' fun little musical challenge in their Mancat Monday post yesterday. Don't you feel bad that these poor kitties have to deal with such a slacker of a human? Anyway, we're still working on a previous week's Curious as a Cathy Mewsic Moves Me blog hop challenge. We hope no one minds our glacial pace in completing this challenge. For what it's worth, we're having lots of fun with it! So, this challenge we're working on involves spelling out your name using song titles. Thimble and Eddy have already given it a go. Today, the boys get their turn. Oh, and in case you're wondering, pup Astrid will share hers tomorrow. Evan especially likes his letter V, as Veronica is the name of his auntie. But, we digress. Now, on to Toby. So, those are the boys' musical monikers. This here human's sister, who happens to be Evan's auntie Veronica and Toby's mom, helped them brainstorm these songs. After all, she is the song guru around here. We're wishing all of you a terrific Tuesday! 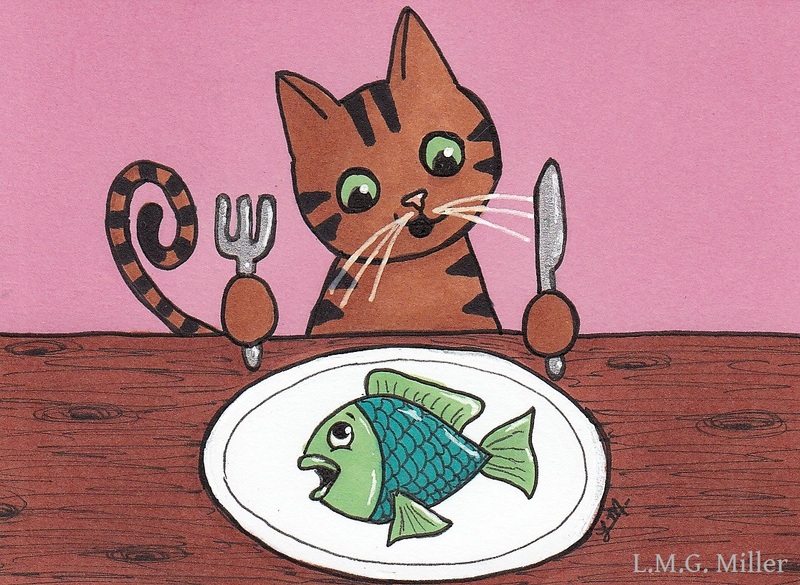 Today's foodie doodle was created for Thimble. This little lady cat will only eat one thing as a treat, and that is baby food. Her favorite flavor is ham, and so of course we sort of went with that. Today's summer safety tip is about your furbaby's care in the event that you are traveling this summer. We'll begin with if your furbaby is staying behind while you travel, in which case it is important to plan well in advance for their care. If your furbaby would do best being boarded, then be sure to schedule this well ahead of time, to ensure that they can stay at a veterinary or other boarding facility that you trust. 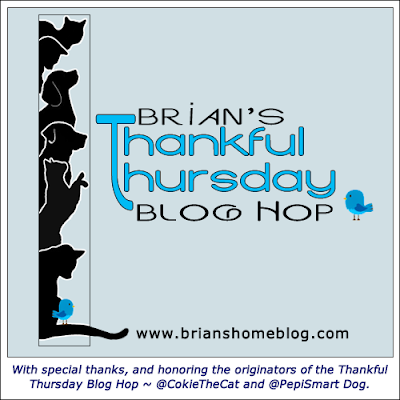 Another option is of course having your furbaby stay home and having a trusted pet-sitter come in to care for them, or to your cat or dog them stay with someone you trust. No matter what route you take for your furbaby's care while you are away from them, be sure that whoever is looking after them has all of the resources and information they might need. Make sure that your furbaby's food is stocked up, as well as their medications, litter, and anything else of importance. Ensure that their caregiver knows the details of their care, including what, when, and how much they are fed, as well as any medication administration instructions they might need. Don't forget other resources a pet-sitter might need, such as any pertinent details of your furbaby's medical history, as well as the contact information for their veterinarian. Then there are the times that our furbabies travel with us on vacation, and it is also important to plan accordingly in this case as well. To begin, make sure that you pack all that your cat or dog might need. This would include food, treats, water, medications, leash, carrier, and anything that is significant for their daily care. It is of course also important to plan in advance for pet-friendly lodging at your travel destination. Are you staying at a hotel? If so, is that hotel pet-friendly? Or, are you staying with family or friends? If so, do they have a pet-friendly home? Are there other animals at this home, and if so, will it be safe for the animals to interact? Be sure that any such details are ironed out well in advance. With all of the above planned out, there is then the actual act of traveling with your furbaby. If you are traveling by plane with a pup or kitty, this will of course require you to learn of the airline's requirements, and that you do so with plenty of time to spare. A veterinary visit and a certificate of health may be required by some airlines. Regardless of whether a certificate of health is required, it is important to discuss with a veterinarian whether your furbaby is safe for travel by plane, especially if they are sick, geriatric, or if they do not travel well. If it is by car that you are traveling, ensure that your cat or dog has a cage or seatbelt for safe restraint during travels. Make sure that your furbaby has a chance to eat, drink, and bathroom during long trips. At the same time, make sure that they are safe from escape anytime you stop and open any car doors. Summer is a time for travels for some people, and perhaps even their furbabies. Whether you leave your furbaby home or take them with you, always plan well in advance. Always keep in mind your furbaby's health and happiness, and discuss any concerns with a veterinarian. The two mancats around here, that being Evan and Toby of course, love their pup Astrid. One of their favorite things about her seems to be her smell. Pardon the quality of this photo, as it was snapped on a camera phone. But, anyway. What you're seeing in that there photo are Toby and Evan thoroughly enjoying Astrid's harness and leash. When I return home from a walk with Astrid, the boys usually intercept me as I remove her harness and leash. I then have to surrender the harness and leash to Toby and Evan, so that they can get their fix. They roll in Astrid's harness and leash, take big whiffs of them, drag them around, and just all around have a grand time with them. The relationship between the furbabies at our house makes me smile. Don't get me wrong. There are certainly moments of disagreements and discord between the fursibs around here. But, for the most part, I just love watching them all interact. All of the cats just love pup Astrid to pieces. Well, except Eddy, who leaves it at tolerating the dog's existence. The other kitties, though, don't care one bit that Astrid's a dog. They love her no matter her species, and they follow her around, rub on her, and, for some reason, seem to enjoy rolling in her ears. Astrid, for the most part, just lets the kitties have their way with her. It has always amazed me how terrified Astrid is of other dogs, but how she wants to meet every cat she sees. My parents have 11 cats, and not even a single one of them hide from Astrid. She is so great with cats, that even the ones who loathed the sight of her at first now tolerate her just fine. Oh, and some of my parents' cats also love to have their way with Astrid's harness and leash when she's at their house. Astrid must smell pretty darn good to the kitties in her life. The fondness the kitties and pup Astrid have for each other, regardless of the classic inimical interactions often expected between these two species, got me thinking about an inspiring quote I've heard before. Though the Sparks blog hop is currently on hiatus, while host Annie of McGuffy's Reader takes a well-deserved blogging break, I figured I would still share this inspiring quote today. Wishing all of you a lovely, love-filled day! 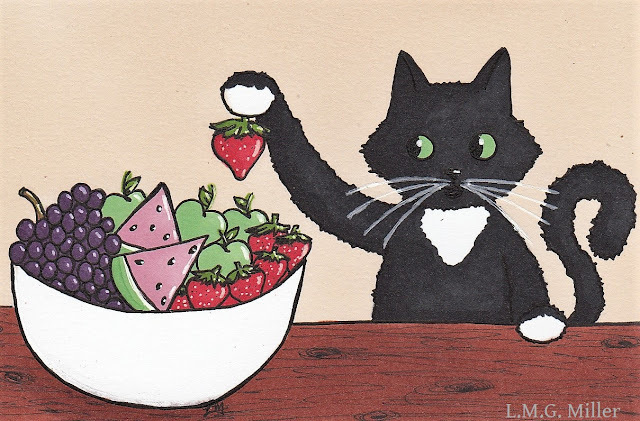 Today's doodle was created in honor or housemate Toby's love for strawberries. Over the next couple of days, our foodie doodles will be ones crafted up specifically for the furbabies around here. After that, we'll be tackling more of the suggestions you all gave us for foodie doodles. 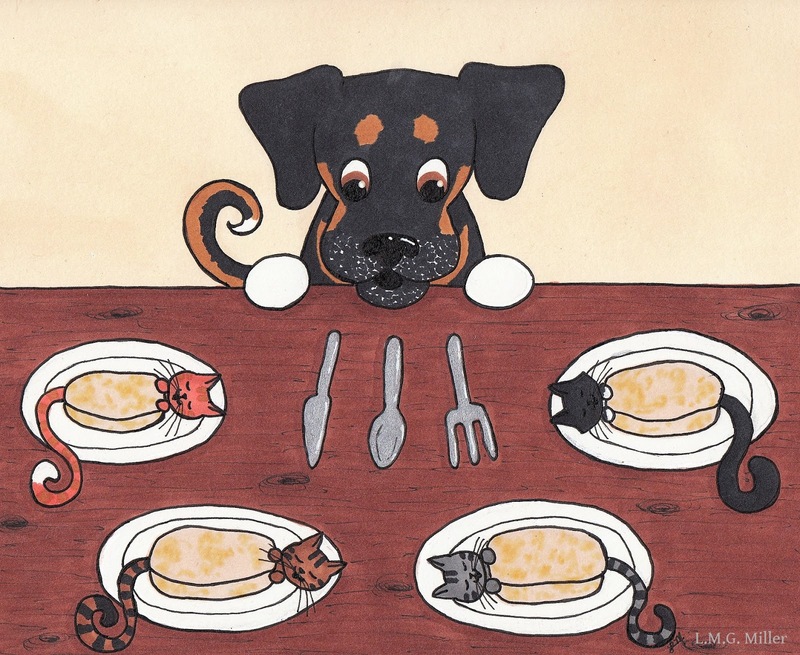 We're looking forward to drawing lots of foodie furbabies! Today's summer safety tip is to be careful around water. Summer often means swimming in pools, or visiting lakes or other bodies of waters. If your dog or cat is with you when you visit the pool or any body of water, always be cautious and keep an eye on them. Though many animals have the instinct to swim when in water, that does not mean they cannot drown in certain situations. So, as needed, block access to pools so that your cat or dog cannot access the water, especially when not closely monitored or when they are not used to being in or near water. If you take your pup or kitty to visit a lake, to go on a boat ride, or to participate in any other similar water activity, keep them near you, such as safe on a leash. In addition to this, you can get flotation devices specifically designed for furbabies. This can come in handy especially for furbabies who are new to water, or if you have any concern for their safety when around water. After all, what do we always say? It's always better to be safe than sorry! So, if your summer plans with your furbaby include some watery ones, plan ahead for their safety. Hello and happy Sunday, friends! Today is the day of the selfie. 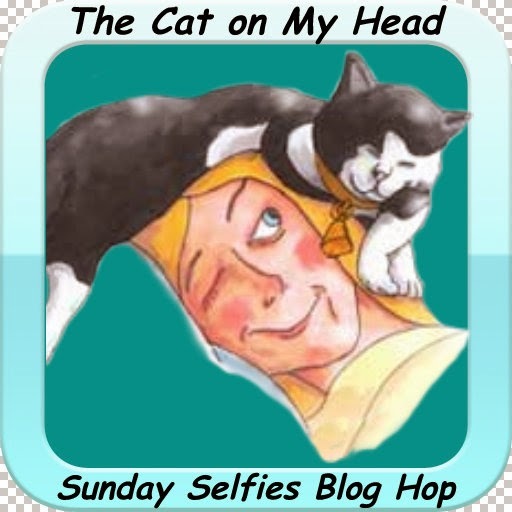 That is, it's time for us to participate in the Sunday Selfies blog hop, hosted by the Kitties Blue over at The Cat on My Head. A certain mancat around here stepped up to snap some selfies this week. That mancat is none other than Evan! Pardon Evan if he was a tad bit distracted for these selfies. Window whiffies are a very important matter of business. We hope all of you friends of ours are having a stupendous and sunny Sunday! We're continuing our series of foodie doodles. 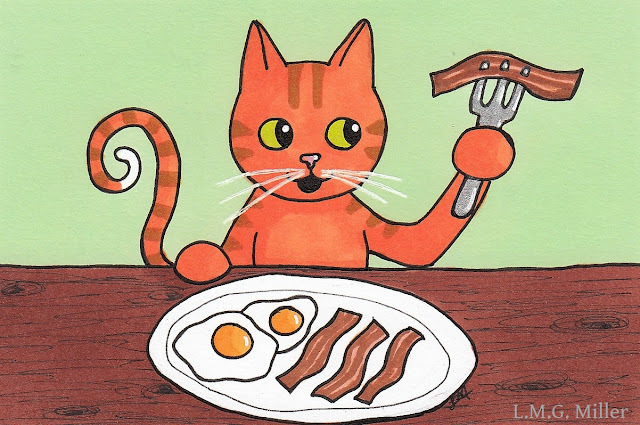 Yesterday, when we asked what foods you might like to see us doodle, the fabulous Lone Star Cats suggested bacon. We thought that was a mighty fine idea. We're working on doodles for the other suggestions we received as well! Summer can be a fun time of the year. For example, there is often a barbecue or two to be had during the summer months. That being said, keep in mind that events such as barbecues may not be the safest place for our pups or kitties. A hot grill in itself can pose risks, of course including burns. Then there are the foods that are often served at barbecues, many of which could be toxic to cats and dogs. For example, onions, or dishes containing onion, can be hazardous. Don't forget some of the other dangerous foods that might be found at barbecues, including alcohol, chocolate, garlic, and grapes and raisins, just to name a few. A dog or cat can find themselves in dangerous situations if they are not closely monitored or if they are underfoot at events such as barbecues. For this reason, it might be best to keep your pups or kitties somewhere safe and out of the way during a barbecue or other similar summer events. As we always say, it's always better to be safe than sorry. We mentioned yesterday that we're doing a series of doodles revolving around food. Don't worry, though, all of these doodles will also have furry stars! See? What kinds of foods might you all like to see us doodle up? We're always open to suggestions! 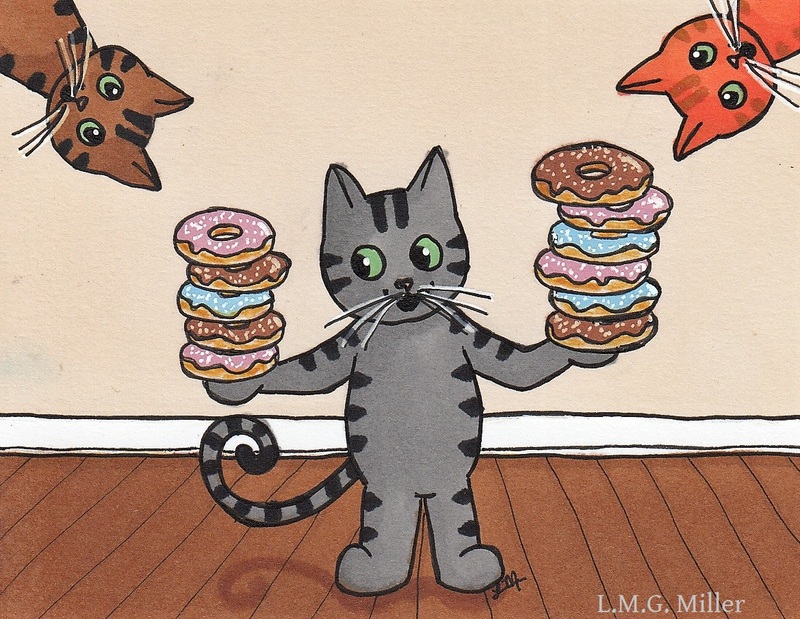 Our donut doodle up there is indeed our contribution to Athena's Caturday Art blog hop. Happy Caturday to one and all! Today's summer safety tip is a bit of a grooming reminder. While it is of course more than okay to regularly trim nails, brush, or even lightly trim your cat's or dog's coat, keep in mind that shaving them in the summer can have negative effects. Just as our cats and dogs need their coat to stay warm in the winter, they also need it to remain cool in the summer. This is because cat and dog coats not only insulate warmth in the winter, but that furry coat also insulates cool air in the summer. That's not all, though. Remember our discussion on sunburn yesterday? Well, shaving our furry cats and dogs can cause their skin to be more exposed to the sun, which of course can result in sunburn during these hot, sunny months. Sunburn, as we said yesterday, can lead to painful skin issues as well as potential skin cancer, and no one wants that. So, though it might sound reasonable to shave your furbaby down to the skin to help them stay cool in the summer, that is actually not the best of ideas. Let them keep their coats this summer, so that they can insulate cool air and have some protection against those sunny rays. Regularly brushing and trimming up that coat is more than fine, but don't take their coat away altogether. Of course, if you have questions on this topic of grooming and coat and skin care in the summer, do discuss it with your veterinarian. Who's ready for the Friendly Fill-Ins? As we mentioned last week, Annie of McGuffy's Reader is taking a much-needed and very well-deserved blogging break. So, I am excited to be serving as the co-host to Ellen of 15andmeowing. In case you missed the fill-ins yesterday, here they are again. Ellen crafted up the first two, and I came up with the last two. 2. Ten years ago, I _________. 4. Most people don't know that I _________. And here are my completed fill-ins, with a solid dose of my usual rambling as well. 1. Happiness is sometimes a choice. 2. Ten years ago, I was counting down the semesters until I was finished with college. 3. A purring cat is the best medicine. 4. Most people don't know that I was home-schooled for three years. or in the comments over at Ellen's blog, 15andmeowing. Don't worry, we didn't forget to give you your Friday dose of Eddy. We have a couple more miraculously non-blurry shots of Eddy, snapped while she was enjoying some window whiffies. Eddy doesn't just have that lovely shot of her to share, though. Just like Thimble did yesterday, today Eddy is partaking in a fun little musical challenge. We are very late to the Curious as a Cathy Mewsic Moves Me blog hop, but we recently learned of one of these on our friend Stunning CK's blog. The one she recently shared involved the simple task of spelling out your name using song titles. All of the furbabies around here decided to have fun with this, with the help of their music-loving Auntie (aka, this here human's sister). So, here is what Eddy and her Auntie came up with for Eddy's name! E: "Edelweiss" from the musical/movie "The Sound of Music"
Eddy and all of us here hope that you all have a fabulous Friday! 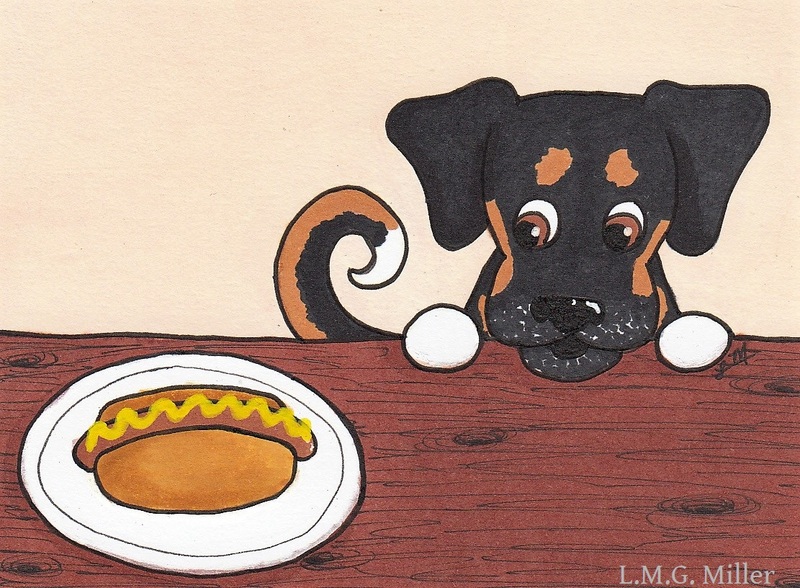 Our newest series of doodles is all about food. Because, well, food. Today's summer safety tip is all about sunburn. Just like us humans, our furbabies can get sunburned. This can happen during time outdoors, or even by sunbathing in windows or doors. And, just as with humans, sunburn can result in skin cancer in our cats and dogs. This is why it is incredibly important to be aware of this and to take precautions. Keep in mind that cats and dogs with little to no fur are of course more susceptible to sunburn. In addition to this, those with light fur and skin, such as those that are white or orange coats, are also more susceptible. That doesn't mean furbabies of other colors are not at risk, though. In addition, the areas of the body most likely to get sunburn are the ears, nose, and belly, as in most furbabies these areas have less hair coverage. Again, though, this doesn't mean sunburn or skin cancer cannot occur elsewhere on the body. What are the signs of sunburn in your furbaby? They are very similar to those in humans. A cat or dog with sunburn will typically develop pink or red skin, which is often inflamed as well. The sunburn is often painful, and the affected skin can also become dry and flaky. Hair loss can also occur around the sunburned area. These are all signs to be aware of, but they are also things that you want to try to prevent from happening in the first place. So, what can you do to protect your furbabies from sunburn and potential resulting skin cancer? You can of course minimize their time in direct sunlight, whether that be while outside or while sunbathing in a window or door. You can opt for outdoor activities when the sun is not at its peak, as well as opting for shade when outdoors. When it comes to indoor furbabies, you can close doors and curtains to help protect against sunburn during the sun's prime time of the day. In addition to this, there are certain window types and window covers that can help block UV light. These could certainly be useful for frequented windows and doors, but this also of course may not guarantee full protection against sunburn or resulting skin cancer. Finally, another option for sun protection is, of course, sunscreen. This is especially important for furbabies who frequently go outdoors in the summer sun, or even for those who frequently sunbathe indoors. There is pet-safe sunscreen available on the market. Many sunscreens designed for humans can contain ingredients that are potentially toxic to cats and dogs, so it is indeed important that you look for products formulated especially for your kitty or pup. What's more, as we always say, if you have any questions at all regarding sunburn and skin cancer in your kitty or pup, be sure to discuss this with your veterinarian.